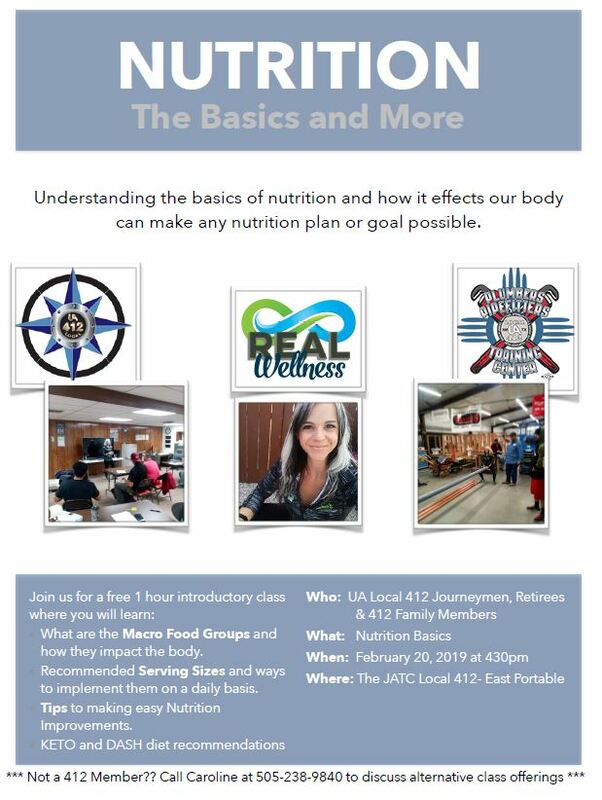 Nutrition Basics Class – February 20, 2019 at 4:30 PM. 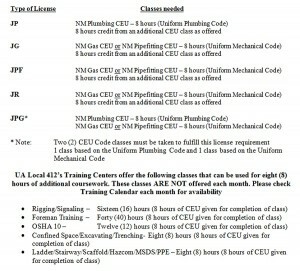 To be held at Local Union No. 412 JATC’s East Portable. …This policy sets forth the fundamental principles underlying all that we do in the UA. These are words we intend to live by. The UA Standard for Excellence policy not only outlines the obligations of UA members on the job; it also spells out the obligations of our signatory contractors as well. In this way, we are making it clear to all parties-including construction owners-that we are dedicated to doing the best job possible. I encourage you to keep this booklet handy and refer to it from time to time, especially when situations arise on the jobsite that could undermine our commitment to excellence. This policy represents the best workplace ethics and it can help to ensure success in your career as a professional UA tradesperson. I believe that the United Association is, without a doubt, the best union in the building trades. Let’s keep it that way by following the principles contained in our Standard for Excellence. •Meet their responsibility as highly skilled craftsworkers by providing the required tools as stipulated under the local Collective Bargaining Agreement while respecting those tools and equipment supplied by the employer. •Use and promote the local union and international training and certification systems to the membership so they may continue on the road of lifelong learning, thus ensuring UA craftworkers are the most highly trained and sought after workers. •Meet their responsibility to be fit for duty, ensuring a zero tolerance policy for substance abuse is strictly met. •Be productive and keep inactive time to a minimum. •Meet their contractual responsibility to eliminate disruptions on the job and safely work towards the on-time completion of the project in an auspicious manner. •Respect and obey employer and customer rules and policies. •Follow safe, reasonable and legitimate management directives. •Replace and return to the referral hall ineffective superintendents, general foremen, foremen, journeymen and apprentices. . Provide worker recognition for a job well done. MCAA/MSCA, PFI, MCPWB, PCA, UAC and NFSA and their signatory contractors have the responsibility to manage their jobs effectively, and as such have the following responsibilities under the UA Standard for Excellence. •Ensure that all necessary tools and equipment are readily available to employees. •Minimize workers’ downtime by ensuring blueprints, specifications, job layout instructions and material are readily available in a timely manner. •Provide proper storage for contractor and employee tools. •Provide the necessary leadership and problem-solving skills to jobsite supervision. •Ensure jobsite leadership takes the necessary ownership of mistakes created by management decisions. •Encourage employees, but if necessary, be fair and consistent with discipline. •Create and maintain a safe work environment by providing site specific training, proper equipment and following occupational health and safety guidelines. •Promote and support continued education and training for employees while encouraging career building skills. •Employ an adequate number of properly trained employees to efficiently perform the work in a safe manner, while limiting the number of employees to the work at hand, thereby providing the customer with a key performance indicator of the value of the UA Standard for Excellence. •Treat all employees in a respectful and dignified manner, acknowledging their contributions to a successful project. •Cooperate and communicate with the job steward. •The local union and the steward will work with members to correct and solve problems related to job performance. •Job stewards shall be provided with steward training and receive specialized training with regard to the UA Standard for Excellence. •Regular meetings will be held where the job steward along with UA supervision will communicate with the management team regarding job progress, work schedules, and other issues affecting work processes. •The job steward shall communicate with the members about issues affecting work progress. •The business manager or his delegate will conduct regularly scheduled meetings to discuss and resolve issues affecting compliance of the UA Standard for Excellence policy. •The steward and management will attempt to correct such problems with individual members in the workplace. •Individual members not complying with membership responsibility shall be brought before the Local Union Executive Board, which will address such members’ failure to meet their obligation to the local and the UA, up to and including filing charges. The local union’s role is to use all available means to correct the compliance problem. •Regular meetings will be held where the management team and UA supervision will communicate with the job steward regarding job progress, work schedules, and other issues affecting the work process. •Management will address concerns brought forth by the steward or UA supervision in a professional and timely manner. •A course of action shall be established to allow the job steward and/or UA supervision to communicate with higher levels of management in the event there is a breakdown with the responsible manager. •In the event that the employee is unwilling or unable to make the necessary changes, management must make the decision whether the employee is detrimental to the UA Standard for Excellence platform and make a decision regarding his/her further employment. •In the event an issue is irresolvable at this level, the local or the contractor may call for a contractually established labor management meeting to resolve the issues. •Weekly job progress meetings should be conducted with job stewards, UA supervision and management. •The local or the contractor may involve the customer when their input is prudent in finding a solution. •Foremen, general foremen, superintendents and other management should be educated and certified as leaders in the UA Standard for Excellence policy. The National AFL-CIO has entered in an agreement with Candlewood Suites, whereas Union members can receive special rates at all Candlewood Suites nationwide. The rates start at $64.00 nightly for a Studio Suite; in Albuquerque they are located on 3025 Menaul Blvd. NE. Just request the AFL-CIO rate. 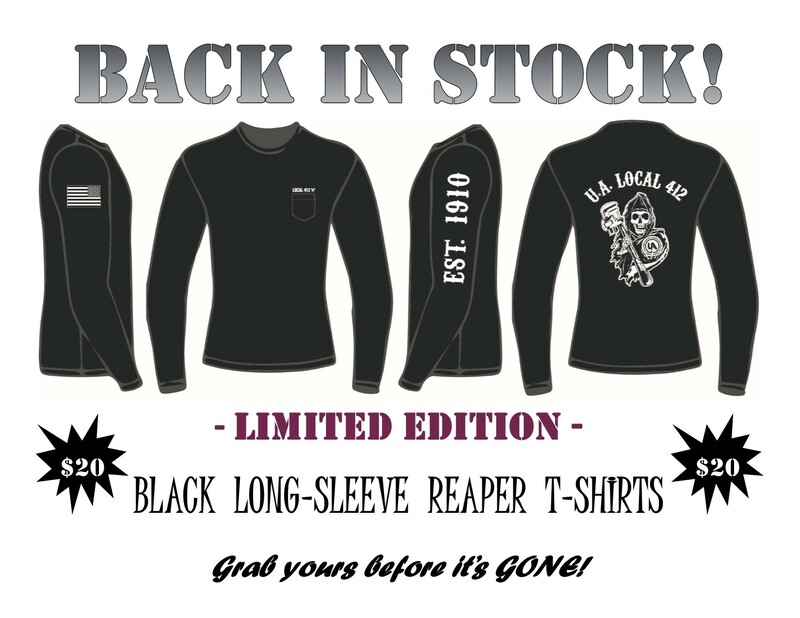 Local No. 412 has no affiliation with Candlewood Suites although we realize many of our members have to rent rooms all across the Country and are hopeful that this will help with the cost of being away from home even if just for one night.